Scene from “A New Brain” at Diversionary Theatre. Like the neurosurgery at the center of the action, “A New Brain” is a delicate operation. It’s a musical, a comedy and a deadly serious autobiographical story of a near-death experience. 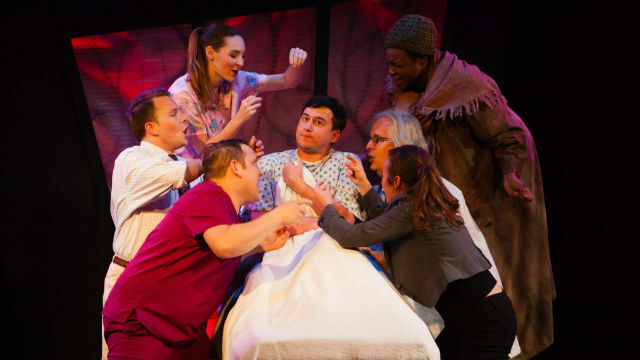 The main character is in a coma for a good part of the show, while everyone around him waits to see the outcome of the sensitive, intricate procedure that may or may not correct his arterio-venous malformation. William Finn, who wrote the music and lyrics (and co-wrote the book with James Lapine) actually went through this harrowing incident, with his longtime partner, Arthur Salvadore (Roger Delli-Bovi in the play) and his neurotic Jewish mother by his side. Gordon Schwinn is Finn’s alter-ego. He’s a neurotic composer, who just wants to write at least one great song before he dies (kind of like Roger, the HIV-positive character who sings “One Song Glory” in “Rent,” which premiered two years earlier. But never mind. Back to Finn’s ostensibly inoperable brain tumor). Schwinn (Tom Zohar) is an anxious Jewish writer with a WASPy boyfriend (Anthony Methvin) who loves to sail (so not Jewish!). Gordon has a close female friend (Megan Carmitchel), a wild-haired doctor (Danny Campbell), a smother-mother (Sandy Campbell), and assorted others, including nurses (Michael Parrott, Katie Sapper), an omnipresent Homeless Lady (Tanika Baptiste) and a monster of a boss, Mr. Bungee (Jon Lorenz), for whom Gordon writes kiddie TV-show songs. Or doesn’t. Much of the musical, a sung-through chamber piece with little-to-no dialogue, takes place in Gordon’s hallucinatory mind. This poses many tonal problems. But it seems that, rather than playing it all kind of straight (as director Kim Strassburger has chosen to do), it would be far more amusing and engaging to play the characters over the top, or at least highly exaggerated, which is what the imagination tends to do. This way, we’re left to wonder: Why is the Homeless Lady there? Why are we hearing so much about that ‘nice nurse,’ Richard (Parrott)? Why doesn’t the minister (Stewart W. Calhoun) have any personality? And why aren’t Gordon and his mother more Jewish? (i.e., borderline hysterical, and sarcastically, preternaturally funny). These are the questions that swirled around my addled brain on opening night, as I watched the musically talented cast struggle through the challenging, non-lyrical score (music direction by Janie Prim). Nearly everyone appeared to be straining outside their vocal range. The choreography (Michael Mizerany) seemed not to be fully learned or smoothly, effortlessly executed. The set (Ron Logan) looked difficult to negotiate at times. But everyone was trying hard. Visibly so. Though most of the songs are unmemorable, there are a few appealingly upbeat full-cast numbers (“Heart and Music,” “I Feel So Much Spring”), some touching ballads (“I’d Rather Be Sailing,” “Music Still Plays On”) and some that should come off a lot funnier than they do (“Throw it Out,” “Be Polite”). “A New Brain,” which ends up being hopeful and life-affirming, requires a graceful and nuanced touch, coupled with a little goofball Borscht Belt sensibility that, at least on opening night, were not in evidence. Like the characters at the end of the show, I’m hopeful that things will work out better over time. Performances are Thursday at 7 p.m., Friday-Saturday at 8 p.m. and Sunday at 2 p.m.. Monday June 15 is Industry Night.